I’ve been here for two weeks now. My internship is going very well although it is very hard sometimes to wake up at 7am after going to bed at 2am. Nice is so beautiful: La promenade des Anglais, La colline du Chateau, The Old Town, The flower market, the food, Oh the food! I haven’t seen everything yet but I just can’t wait to explore what Nice has to offer. The only thing that I don’t like about Nice is the beach. The beaches of Nice are shingle and now my toes are all sore and it hurts. Well, I guess I will get used to it. Today my sister and my nephew came to see me. I was so excited. We went strolling along the beach then went to The Old Town to have some ice cream. A friend of mine told me that you would find the best ice cream there. We had to check it out. We weren’t disappointed. The counter of ice cream was 6 feet long, with over 30 varieties of ice cream, gelatos and sorbets. My sister went straight for her favorite flavor: caramel and coffee ice cream and I went for a flavor that caught my eyes right away: Lavender ice cream. A bite of it and I had the feeling to be… a dirty shirt inside a washing machine. The lavender ice cream reminded me of a fabric softener. It was too much lavender for me and I couldn’t finish it. My sister was really enjoying her ice cream, licking every drop that would fall on the sides. And I was there watching her. Yesterday I bought a bag of lavender flowers. I was torn between making some muffins or sables. I went for muffins. I have never been scared of flowers before, but since my ice cream experience I am just terrified of everything that involves flowers and food together. 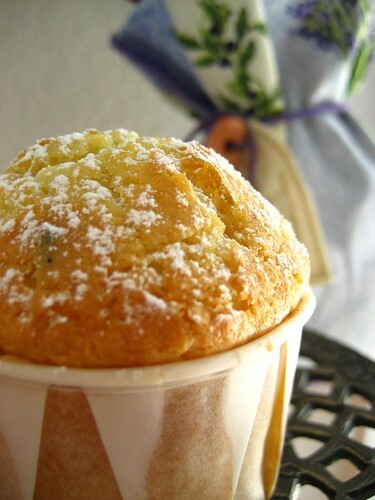 I love the smell of lavender, I find it very calming but I just couldn’t imagine how it would taste in a muffin. I took a basic vanilla muffin recipe and turned it into a lavender, lemon and pine nuts muffins. “Breath, Rose! Breath!” I was telling my self all the time. Once the lavender was mixed into the batter I could have sworn I was in a lavender field. It smelled like spring. Into the oven, 25 min later I had my muffins and they were beautiful. “Don’t rush it Rose! Let it cool completely then you can have a taste”. My fear of lavender scent fabric softener was gone once I had those muffins. They were so fragrant, yet not overpowering. There was just the right amount of lavender. The only thing that I would add next time to the batter is some honey because it needed a little bit of sweetness. M thought they were “interesting”. What? What does he mean, “interesting”? Have a lavender ice cream, Honey! That’s very “interesting”. In a bowl, stir together the flour, baking powder, baking soda, salt, sugar, lavender, pine nuts and candied lemon peels. In another bowl, Combine the eggs, milk, and butter and beat just until blended. Add the dry ingredients and mix just until moistened. Do not overmix. 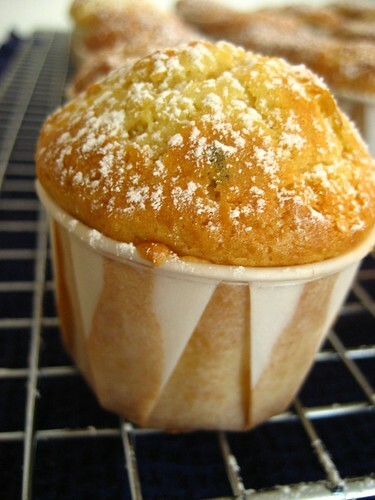 Spoon the batter into prepared muffin cups, filling each cup about three-fourths full. Preheat the oven to 425F and bake for about 15-18 min or until a toothpick inserted comes out clean. Let cool on a wire rack. Sprinkle some icing sugar on top. Store in an airtight container at room temperature for up to 2 days or freeze for up to 1 month. Dans une grande jatte, melanger la farine, la levure, la bicarbonate de soude, le sel, le sucre, la lavande, les pignons de pin et le citron. Dans un autre bol, melanger les oeufs, le lait et le beurre jusqu’a ce qu’ils soient bien incorpores. Verser dessus les ingredients secs d’un seul coup et melanger. Ne melanger pas trop. Verser dans des moules a muffins et faites cuire dans un four prechauffe a 220C pendant 15-18 min. Laisser refroidir sur une grille a patisserie. Saupoudrer de sucre glace. Ces muffins se gardent pendant 2 jours dans une boite hermetique ou peut se congeler pendant un mois. This looks sooooo good! I have never used lavendar in my cooking/baking, but I really want to try it out. Lavender is my fav flower! Rose, this looks really good. I loved the write up too it cracked me up. I too am always rather careful with lavender. It can get too fabric softener like! oh, un très joli billet comme je les aime..on ferme les yeux et on se retrouve a tes cotés, merci pour ces quelques minutes d'évasion ! Mmm, this looks like it would go perfectly with a nice cup of tea. Lovely recipe! What a cute muffin! I love lavender and did a post about it actually. I'm hoping that my lavender plant will bear some flowers, so I can try cooking with it too! Rose, what a lovely post!! 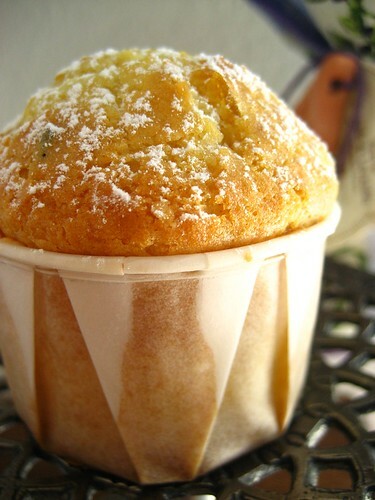 Poor you, I'm sorry the lavender ice cream was bad - but these muffins paid that off beautifully! They look wonderful! These muffins are beautiful! I have never had anything lavender flavored, so I wouldn't even know what to expect. These sound lovely, though. I really want to try some lavendar sweet things, and look so good. I hope that was interesting good!! Rose, I am addicted to lavender in ALl forms, so I will definite love this. Thanks! I've never cooked with lavender (Where does one buy it in the US?) nor tasted anything with it, but your cupcakes make me want to give it a go. They are beautiful and I swear I think I can smell them from here! I love biting inot it but my husband does not so what I do is infuse the butter or the cream or mik with the buds and then strain. Your muffins look so appetizing! Beautiful pics too. How nice to be able to come full circle! Your muffins are so pretty, Rose! Beautiful muffin. I also have never used Lavendar in a recipe. In fact I have never used any flower flavor for the same fear as you, that it would taste like a fabric softener. They sound wonderful! I'm so glad this was a better lavender experience for you. =) heee! Interesting indeed...but interesting in a fantastic way! Juste une merveilleuse recette qui fait voyager les sens! - Thank you very much Anh. Let me know how you like it if you try it. - Thanks Meeta for your message. With lavender it is all about being careful not to add too much. - C'est tres gentil de ta part Claude. Cela me fait tres plaisir. - Sounds good to me Aimee. I 'll bring the muffins. - Thanks Anali, just remember to dry them first before cooking. - When I think about it now, it makes me laugh but believe me Patricia back then I wasn't laughing, just trying wash the taste out of my mouth. - Thank you very much Deborah. - I stilll don't know if it was interesting good Kelly-Jane. I think it was more interesting not used to it. - Great to see another Lavender fun. Thanks Nora. - You are too sweet Betty Jo. I bought mine from World market, at the spice section. I think you can find them too at the farmer's market. Just remember that they need to be dry not fresh lavender. - Nice tip Helen. Merci beaucoup. - You are too nice Ivonne. Thank you very much. - Merci beaucoup Lili. contente de voir que ca te plaise. - It is about putting the right amount of lavender, Cheryl. - It was a better one, indeed. Thanks Lis. - That's sweet of you Kristen. Thank you very much. - Merci beaucoup Sha. Je t'invite a voyager quand tu veux avec mes muffins. These are beautiful Rose I love any kind of muffin but these are so elegant and perfect. I haven't cooked with lavender before though I have a few recipes stashed away for a braver day. I have experimented a little with elderflowers but they are less daunting than lavender. Good advice...a small amount of lavendar goes a long way. These look really good. The addition of pine nuts is brilliant.